Here is an excerpt of the items you can find about our work through the web and in the press. References, real weddings, interview: an overview that gives pride to wedding photography and all marriages styles. Follow the links to read the full articles. 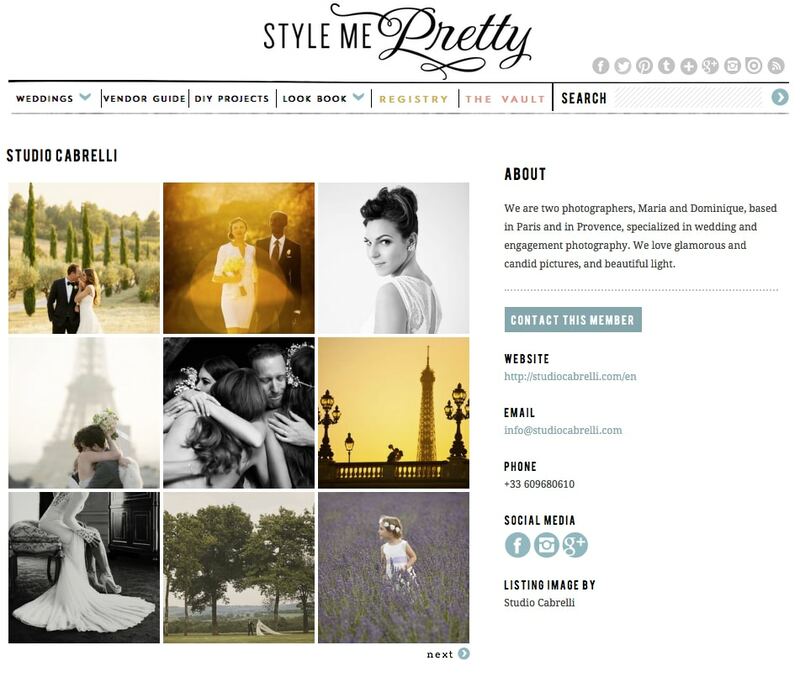 Style Me Pretty is one of the references in wedding blog and we are very proud to be a member of the Black Book, a consecration for any photographer ! 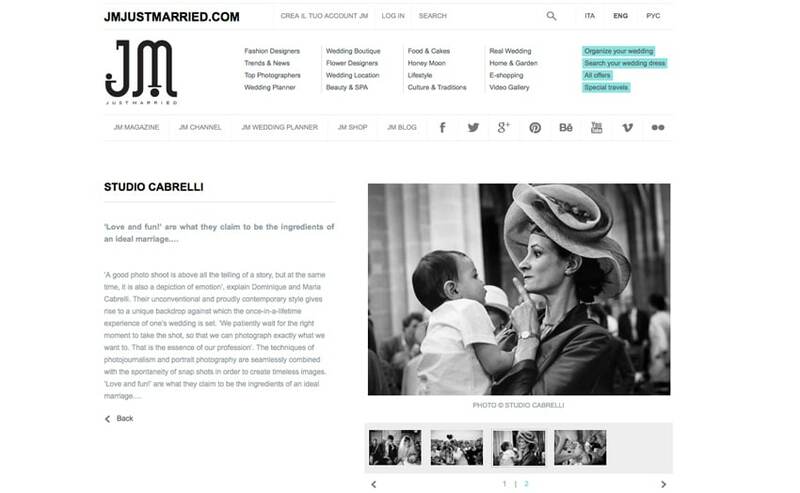 Harper ‘s Bazaar is one of the references in magazines around the world and we are very proud to have our images published through four pages in this beautiful wedding magazine, a consecration for any photographer ! See publication on our blog post dedicated to Harper’s Bazaar Arabia . 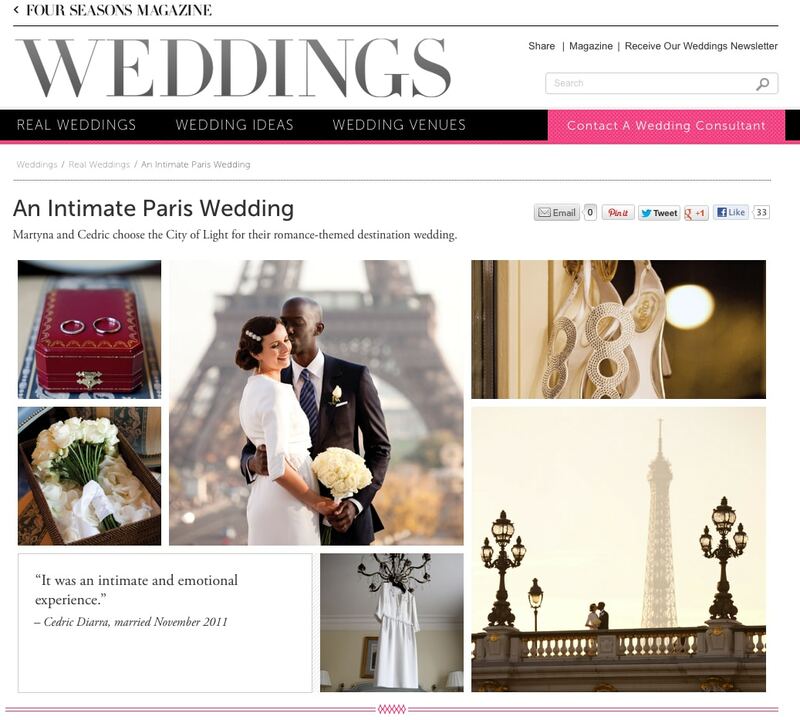 “Is there anything more romantic than a Paris wedding? Elina and Ken’s Parisian affair included a classic silver and pink color palette and striking Eiffel Tower portraits of the couple. The decor designed by Dreams in Paris perfectly accented the overall chic atmosphere of the day, all of which was captured by Studio Cabrelli. We cannot get over the bride’s incredibly stunning Lazaro gown!” Find more wedding pictures in our blog. ‘A good photo shoot is above all the telling of a story, but at the same time, it is also a depiction of emotion’, explain Dominique and Maria Cabrelli. Their unconventional and proudly contemporary style gives rise to a unique backdrop against which the once-in-a-lifetime experience of one’s wedding is set. ‘We patiently wait for the right moment to take the shot, so that we can photograph exactly what we want to. That is the essence of our profession’. The techniques of photojournalism and portrait photography are seamlessly combined with the spontaneity of snap shots in order to create timeless images. ‘Love and fun!’ are what they claim to be the ingredients of an ideal marriage.…Read more in JM Just Married website. We have the immense pride of the providers referenced by the Four Seasons Hotel George V in Paris, ranked as the best hotel in the world , which regularly organizes wonderful events and weddings. 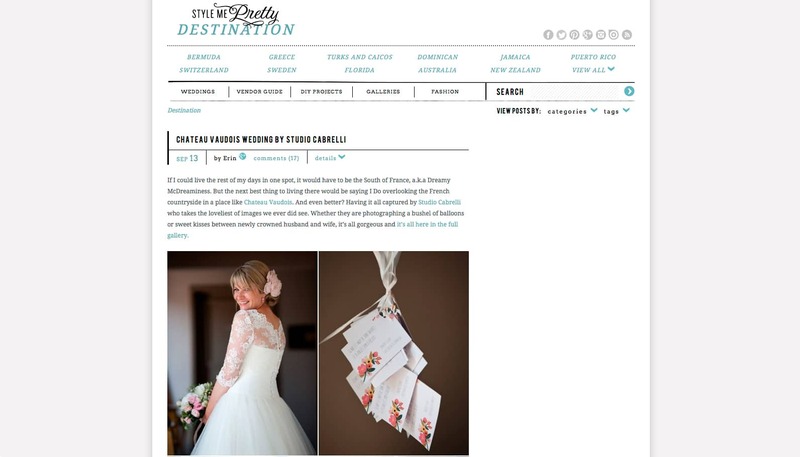 A beautiful wedding we photographed was published in the web publishing and paper prestigious Four Seasons Weddings Magazine International. Discover this beautiful wedding and floral decoration Jeff Leatham on the web site of the Four Seasons Weddings Magazine. ” Well I’m just back from my holidays and had a great time and you know what, it’s not so bad coming home when I get to look at pretty things everyday and today is no exception! Yesterday we showed you a masterpiece of a movie by Studio Artifice and today, we are incredibly lucky to be able to share the stunning photographs. 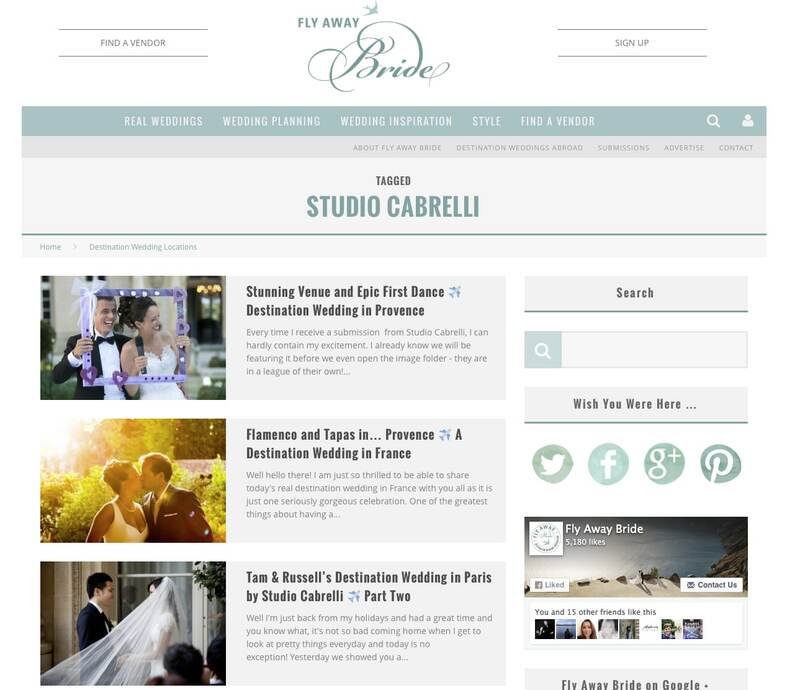 I fell head over heels for this wedding the first time I watched the movie and well, when I saw that Studio Cabrelli were the photographers on the day, had to have the images to share!